To become a registered nurse, you have to pass the National Council Licensure Examination, or NCLEX-RN. Many nursing students are understandably intimidated by the prospect of taking the NCLEX-RN exam, which tests how you use critical thinking skills to make nursing judgments. At Ameritech, we have a lot of experience with helping students pass the NCLEX-RN exam. In any given year, approximately 90%+ of our students pass their exam the first time, which means Ameritech’s scores are consistently higher than state and national levels. We’ve found that studying practice questions and familiarizing yourself with the test structure is one of the best ways to prepare for the exam. The NCLEX-RN is organized into four categories: Safe and Effective Care Environment, Health Promotion and Maintenance, Psychosocial Integrity, and Physiological Integrity. We’ve organized our NCLEX-RN exam practice questions based on these categorizes, to give you a good idea what will be asked on the test. 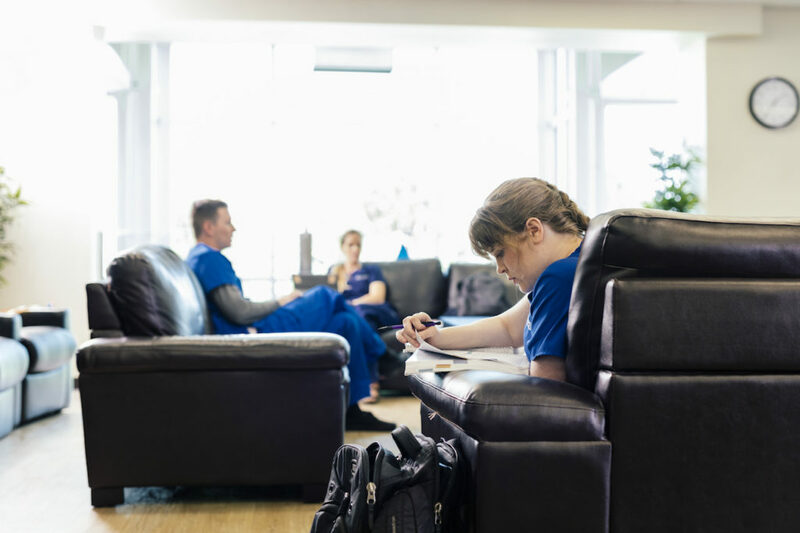 According to the National Council of State Boards of Nursing (NCSBN), 26-38% of the questions on the NCLEX-RN are selected from the Safe and Effective Care Environment category. These questions relate to management of care and safety and infection control. The nurse can safely assign which task to an unlicensed assistive personnel (UAP) for a patient who is stable after a myocardial infarction? A) Measure and record intake and output. UAP responsibilities include performing basic nursing tasks, such as measuring I&O, vital signs, and weight. The registered nurse is responsible for assessment, education, and interventions that require specialized nursing knowledge, skill, or judgment. According to the NCSBN, “The nurse promotes achievement of client outcomes by providing and directing nursing care that enhances the care delivery setting in order to protect clients and health care personnel.” The Safe and Effective Care Environment questions evaluate how well prepared you are for assuming these responsibilities. A train derails near your hospital. Over 25 people are injured and being transported to the emergency department. Which patient should be assessed first? A 36-year old with a sucking chest wound. Nurses must make difficult decisions about establishing priorities during an emergency. If given immediate attention, the patient with the sucking chest wound can recover. The patient with the severe leg laceration and the patient with the compound fracture can be given temporary care, then fully treated later. The patient with the spinal cord injury will not likely survive and should not be given first priority. About 6-12% of the NCLEX-RN exam will include questions from Health Promotion and Maintenance. This category includes questions on high risk behaviors, aging process, and lifestyle choices, as well as a significant subcategory on pregnancy, birth, postpartum, and newborn care. A 32-year old client refuses to have any analgesia or anesthesia during her birth experience. As the nurse assists her during the second stage of her labor, which position should she use to begin pushing? C) Squatting with her body curved into a “C” position. Squatting can help assist with the birthing process by enlarging the pelvis and allowing gravity to assist. The “C” position, in which the woman’s body is curved over her knees, is the best position. About 6-12% of the NCLEX-RN questions relate to Psychosocial Integrity. This category includes questions on chemical and substance dependencies and disorders, mental health, family dynamics, and stress management. At end of life, spirituality and culture can have increased significance for the patient and their family. It is important for the nurse to provide a culturally sensitive environment and privacy for the family when possible within the hospital routine. Answers A, C, and D would create unnecessary conflict with the patient and their family. The Physiological Integrity category is the largest on the NCLEX-RN exam. Questions from this category can make up 38-62% of the total exam. This category includes questions about basic care and comfort, pharmacological and parenteral therapies, reduction of risk potential, and physiological adaptation. The healthcare provider is reviewing the arterial blood gas report for a child with severe, persistent asthma. The blood gas is: pH = 7.28, PaCO2 = 50 mmHg, HCO3 = 25. Which of these assessments are consistent with this child’s arterial blood gas? Disorientation, headache, and flushed face. The normal ranges for ABGs are: pH is 7.35-7.45; PaCO2 is 35-45 mm Hg; HCO3 is 20-24eEq/L. This patient has respiratory acidosis. The excess CO2 leads to headache and facial flushing, and the increased acid causes disorientation. Other symptoms of respiratory acidosis include fatigue, shortness of breath, and sleep disturbance. The questions on the NCLEX-RN exam can be very specific, and will likely require you to think critically. Read each question carefully, and read all the answers thoroughly before you make your choice. Once you’ve answered the question, try not to second-guess yourself—your first answer is usually the right answer. The healthcare provider prepares to administer a corticosteroid to a patient with a diagnosis of asthma. What is the rationale for administering this drug to this patient? Corticosteroids work by inhibiting the inflammatory response and reducing the mucus secretion of a person with asthma. As a result, the airways are less swollen and less likely to react to asthma triggers. The NCLEX-RN exam is based on knowledge and how you apply that knowledge, and less about specific facts you will need to recall. Study with the goal of learning and understanding the questions and their answers, not merely to memorize. During an acute exacerbation of inflammatory bowel disease, a patient is to receive total parenteral nutrition (TPN) and lipids. Which of these interventions is the priority when caring for this patient? Monitor the patient’s blood glucose per protocol. Since total parenteral nutrition can cause hyperglycemia, blood glucose levels must be closely monitored. The TPN solution must be administered via a central venous catheter, not a large peripheral vein. Administration sets should be changed every 24 hours because the high glucose and lipids make the TPN an excellent medium for bacterial growth if the TPN contains lipids. Unlike our practice questions, the questions on the NCLEX-RN exam are not organized by subject content—all of the content is integrated. The more practice tests you take, the more adept you will become at understanding how the questions are structured and developing strategies for selecting the right answer. Before receiving a transfusion of whole blood, the laboratory and blood bank require a sample of the patient’s blood. Which test will be run? C) Blood type and crossmatch. A blood type and crossmatch is necessary to ensure a match between the blood donor and the patient receiving the transfusion. An incompatible match could lead to severe adverse events, including death. CBC, differential, and culture and sensitivity test are unnecessary, and an antibody screen is not necessary for a crossmatch. After you pass the NCLEX-RN exam, you may want to consider enrolling in an RN to BSN program down the road. That’s because a BSN degree will allow you to become eligible for leadership positions and higher earning potential as a nurse. It’s also essential if you want to pursue more advanced degrees, like Nurse Practitioner. Ameritech’s RN to BSN program has an “all-in” tuition model, which means you can finish your degree online in less than 12 months, and the tuition cost is fixed. We also offer an alumni scholarship to Ameritech nursing program graduates to make it even more affordable. In the meantime, we’ve developed time-tested and effective tools to help you pass the NCLEX-RN exam on the first try. Our free eBook, 49 Proven NCLEX Strategies, includes tips for calculating measurements, the best techniques for answering true-or-false questions, and more details about the types of questions that will be asked on the NCLEX-RN exam—in addition to basics like how long the test will take and how much time to spend on each question. Looking for more NCLEX-RN exam tips and strategies? Download our free e-book now.